'We will not keep you [Jews] in our country,' Hamas political official warns, ahead of Cairo conference. Hamas leader Khalil al-Haya insisted that Hamas "would not abandon its weapons" on Saturday, boasting that the group is allegedly closer to defeating "the Israeli entity and its leaders" more than ever. "We say to those who brought the Jews [to Israel] from all over the world, we are now confident and believe more than ever in the implementation of the promise of Allah - that we will not keep you [Jews] in our country," Al-Haya threatened. "The option available to you is to leave the country for its native residents [Palestinian Arabs]." Al-Haya added, in this context, that Hamas is "paving the way" for the success of the Palestinian "unity government," noting that Sunday's talks for international aid for Gaza in Cairo legitimizes the terror group politically and proves that war works. He expressed confidence that the process of reconstruction in the Gaza Strip will be accelerated due to the conference, and that the "armed resistance" is not a burden, but rather a boon to the Palestinian Arab PR war on Israel. 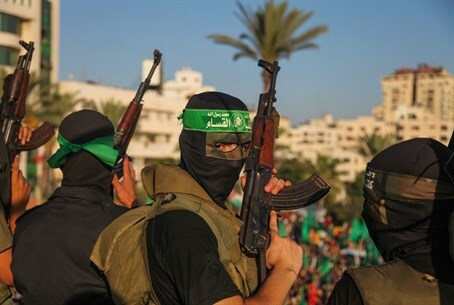 Hours earlier, Hamas spokesman Sami Abu Zuhri threatened to wage war against Israel once again, unless the international community forcibly intervened in Israel's foreign policies to remove travel and import restrictions on the terror government. "If the international community wishes that the situation will not blow up again, it must step in and resolve the situation and handle it through a real and serious removal of the siege," Abu Zuhri stated. This is not the first time that the Palestinian Arab world has threatened Jews - publicly and in official media - with exile or even death. In May, Hamas threatened the wide Jewish world with genocide pledging to kill immigrants to Israel in a cartoon published in its official Palestine (Arabic: Falastin) daily. The publication was later among many shut down by the Israeli government.